I congratulate the Ministry of Water Resources, River Development and Ganga Rejuvenation for organising "India Water Week -2016”. The theme, "Water for All: Striving Together” is of universal relevance - and of great interest to all of us. I am happy that this annual event has been attended by national and foreign experts on water resources management. Foremost policy makers and implementing agencies have shared their experiences and made important contributions to the deliberations. I congratulate Israel, this year’s partner country and commend its Government, scientists, technicians and people for developing practical innovations for optimally utilizing - and saving every drop of water that they can. Ladies and Gentlemen, we must recognise that India faces a huge shortage of this precious resource. While India represents 17 per cent of the world’s population, we possess only 4 per cent of its renewable water resources. As we are aware, the per capita availability of water to our people is decreasing by the day. The impact of climate change on the hydrological cycle and consequent variations in precipitation are causing severe floods and drought with alarming frequency. Due to population expansion, increasing urbanization and industrialisation, demands for water are stretching our resources. It is a growing challenge to meet the needs of our people on a sustainable basis. In our country and all over the world, conservation and optimal utilisation of the limited availability of the world’s water will remain a foremost priority for many years to come. Government of India’s National Action Plan on Climate Change envisages close co-ordination between eight National Missions. One of them, the National Water Mission, was launched in 2011 with the objective of conservation, minimization of wastage and equitable distribution of water. Similarly, Government’s "Interlinking of Rivers” programme is expected to address regional imbalances in water availability. It is expected to provide water for the irrigation of 35 million hectares of land and also facilitate 34,000 MW of hydropower. It will also help in flood control, navigation and inland connectivity. By developing water supply sources close to cities and industrial townships, we would minimise waste, loss in transportation and leakage. I am glad that Central and State Governments are focused on balanced distribution and a 3-‘R’ strategy of reduce; recycle and reuse is being applied to save water. This principle must remain the cornerstone of India’s water management policy. Government’s Integrated Ganga Conservation Mission - the "Namami Gange” initiative - approaches Ganga Rejuvenation by consolidating ongoing works and preparing a comprehensive 5-year action plan. The programme has been supported by a budgetary allocation of Rs. 20,000 crores. I welcome this initiative and look forward to the outcome of this work. Ladies and gentlemen, I would say that it is equally important for us to preserve and safeguard, to the maximum extent possible, our depleting ground water. We must apply improved water-use technologies and better management techniques to our aquifers. We must also strengthen our data base on the quantum and quality of ground water available to us so as to increase the efficacy of our policy interventions. Our Government has recently launched the National Aquifer Mapping and Management Programme. This programme, which happens to be the largest in the world, will facilitate participatory management of ground water for sustainable and equitable benefit to our farmers. I would emphasise the need for popularizing rain-water harvesting and linking it to rural development schemes like the Mahatma Gandhi National Rural Employment Guarantee Scheme. Any strategy for efficient water management would remain incomplete without the active involvement of the community. The participation of the end-user is not only a necessity for successful implementation of schemes - but it should be a development objective in itself. I am glad that the Ministry of Water Resources has taken up the "Jal Kranti Abhiyan” to consolidate water conservation and management with the support of all stakeholders. Further, initiatives for integrated watershed development should be aimed at enhancing soil moisture retention, reducing sediment and increasing land and water productivity. Micro irrigation techniques like drip and sprinkler - and adoption of cropping patterns that are better suited to our own environment - will certainly help us to save water in the agriculture sector. Distinguished delegates, providing safe drinking water to our people is an area where much needs to be done. Too many communities in our country still lack basic water infrastructure: considerable time and energy is spent by their people collecting water instead of progressing to income generating activities. Proper water infrastructure would rejuvenate these populations. In fact, locally feasible technologies and marketable innovations should urgently be introduced in such locations. Involving micro-financing institutions would also help to popularise these technologies. For all these reasons, I cannot emphasise enough the value of a multi-disciplinary approach to water. We must prioritise resilient eco-systems, modern data management systems and innovations in technology. Our laws should inculcate a respect for the principle that water is a common legacy. We must treasure it, utilize it in a manner that enables us to pass it on - intact if not enhanced to our Generation Next. Government’s Krishi Sinchayee Yojana, Nirmal Bharat Abhiyan and Integrated Watershed Management Programme are important programmes to achieve this objective. 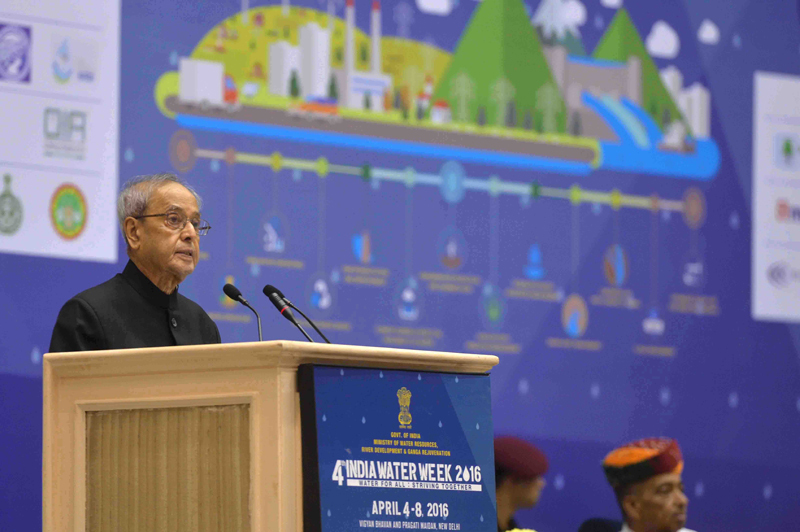 I therefore see "India Water Week” itself - as a key initiative for sharing best practices and exchanging ideas to identify timely solutions to the critical water issues confronting our world today. It is heartening that there has been a good response to the exhibition that concurrently been held - showcasing technologies and solutions for improving efficiencies in water use. I thank the Ministry of Water Resources, River Development & Ganga Rejuvenation for organising this event – and appreciate the contribution of partner Ministries of the Central and State Governments. To all the participants present here, I offer my congratulations and best wishes. May your efforts meet with great success and benefit the people of India, our region and the world!